On Monday, October 22nd, I attended an issue of Live Magazine! - an ongoing multi-disciplinary series that features an evening of entertainment curated by different artists in the community. 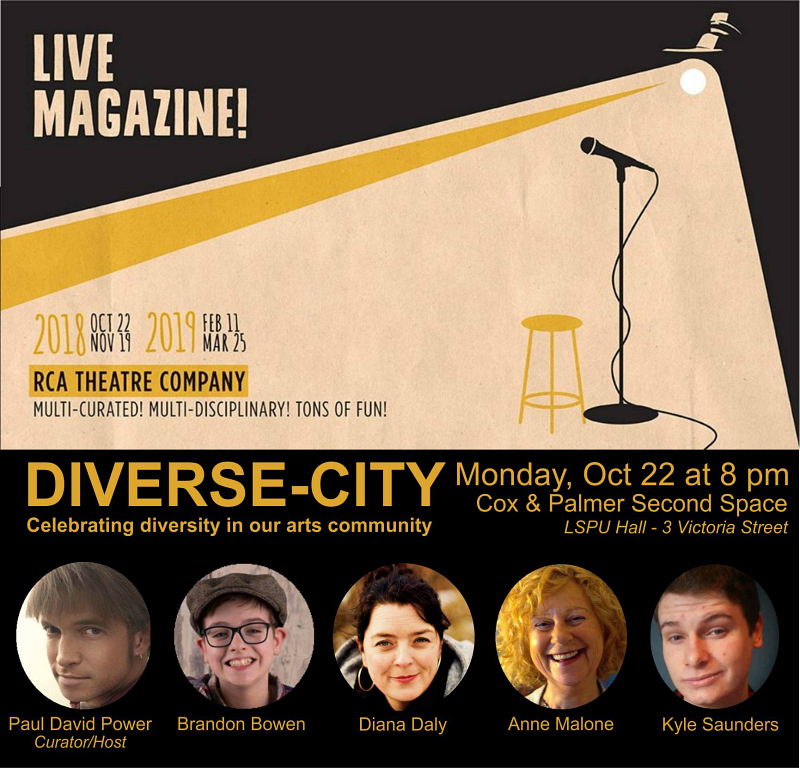 This particular issue was curated by Paul Power of Power Productions, and was titled 'Diverse-City' - celebrating diversity in our arts community. Paul David Power has spent the past 25 years working as a writer, actor, director and communications professional in various mediums including dramatic script for the stage. 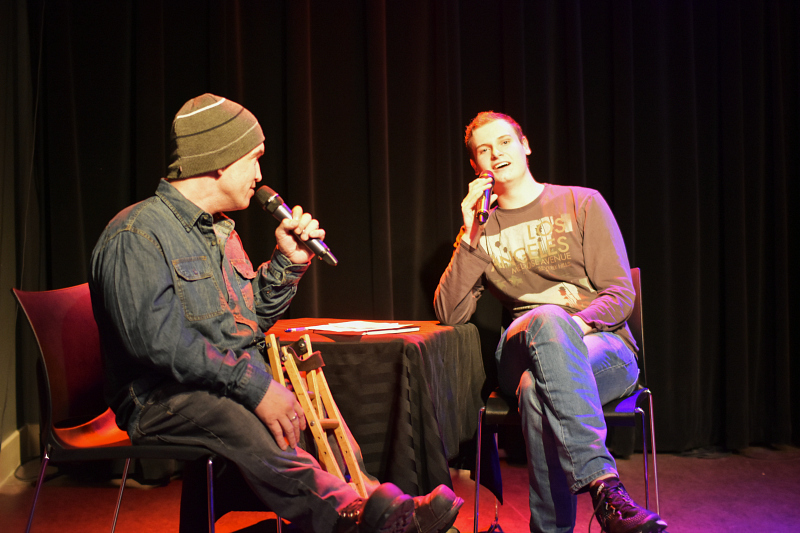 His most recent project, "Crippled" made its professional debut at the LSPU Hall this past February. 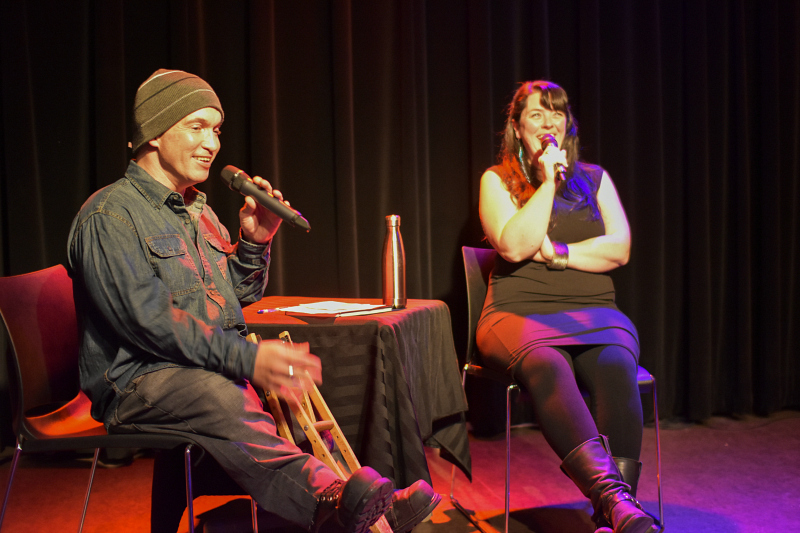 Paul has worked with many national arts organizations including the Canada Council for the Arts and the National Arts Centre to examine and further the disability, Deaf and MAD arts sector. His company, Power Productions, is committed to creating and supporting diverse and accessible theatre projects, with a focus on the disability, Deaf and MAD arts sector. What a stellar line-up of performers in one tiny show! While most teenagers are into the Top 100 hits, 13 year old Brandon Bowen loves to jam out the traditional tunes on his accordion. 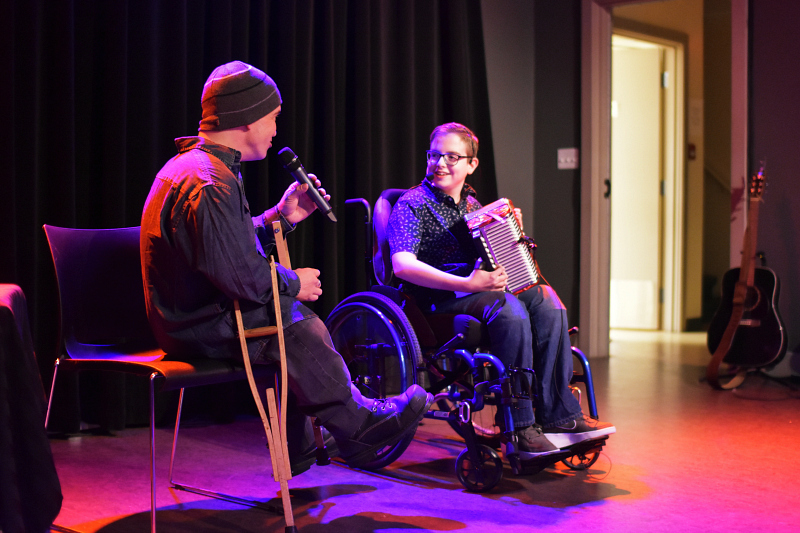 Brandon has cerebral palsy but he doesn’t let his disability get in his way when it comes to his musical talent. He has been playing his accordion for 4 years and has played in many festivals including the NL Folk Festival, Eastport Accordion Festival, George Street Festival, Music and Friends Festival on Bell Island, the Janeway Telethon, O’Reilly’s Pub and he even had the opportunity to play with some popular Newfoundland bands such as Shanneyganock, Rum Ragged and the Masterless Men. Brandon has his own band – 'The Brandon Bowen Band' with his good buddies Russell Molloy and Dave Spurvey. They are always helping out with volunteering to play at events and senior homes. Brandon has also recently branched off into the acting industry, playing the role of Connor in the CBC show, Little Dog. He is also starring in the current NAPE commercial. Keep your eye out for it! Kyle Saunders is a stand up comedian, improviser and actor who is currently studying Psychology at Memorial University. He has been volunteering and advocating for mental health since receiving his diagnoses of bi-polar disorder at the age of 14. He says that he has been on a "wild hilarious ride of manic mental mischief" that makes for an interesting life which wouldn't be possible without the incredible support and patience of his family and friends throughout the years. Kyle says that he enjoys including bits about his struggles with mental health into his comedy acts because it adds a voice and an opportunity for people to talk to him about their own mental health challenges. He is very open about his journey and says that while the jokes can be a coping mechanism, it is also a way to show people that he is capable of performing through the challenges and even making light of some of the hardships he has faced. You can see Kyle's story documented in this video for the Janeway HERE! Anne Malone is a self-described Guide dog wrangler, bias-defiant writer, speaker, and creator who envisions and advocates freedom from disability for people who are blind or visually impaired. Her writing plumbs the depths of history, the classical arts, and popular culture to reveal the origins of deeply buried cultural beliefs about the abilities and characteristics of people who are blind, and the catastrophic consequences these misbeliefs have on blind and visually impaired people around the world. 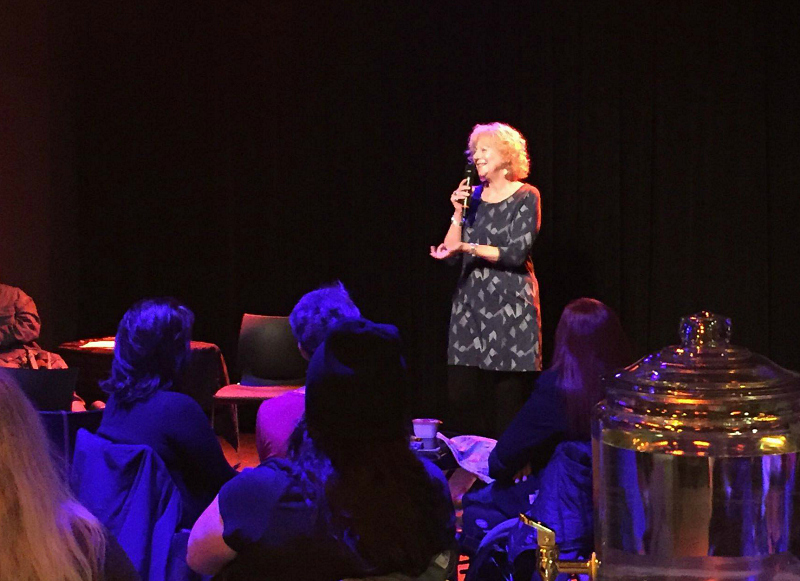 Anne opened her talk by explaining that she is on the "happy experience of vision loss" or as she likes to call it, "eyesight loss", because as she says, "vision is something that's inside, and there's nothing wrong with my vision!" I couldn't agree more, and I thoroughly enjoyed Anne's talk! 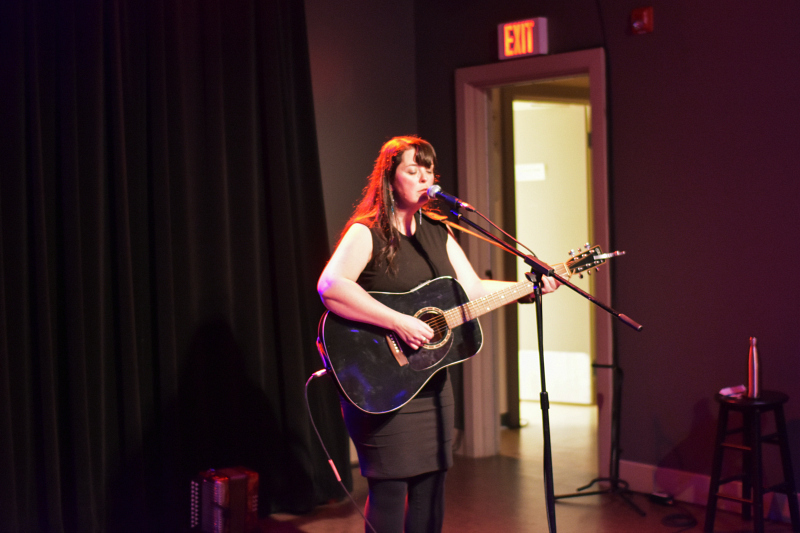 Diana Daly is a multi-instrumentalist, performer, storyteller and songwriter. 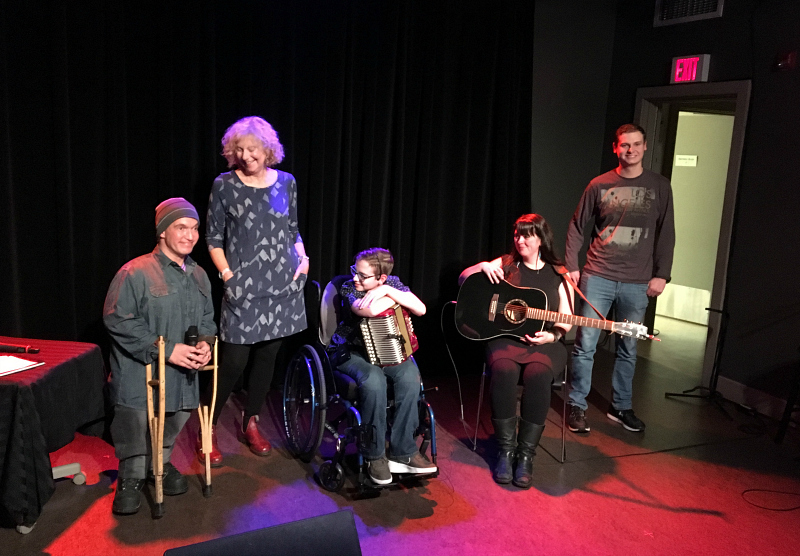 She treated us to a couple of beautiful songs that she wrote for her own stage show, "If A Place Could Be Made", that she performs with her dear friends, Louise Moyes and Anne Troake as part of the Daly Family Collective. "If A Place Could Be Made" tells the story of Diana's own extraordinary family. Her great-grandparents had twelve children, six of whom were exceptionally tall and six had skeletal dysplasia, or what is currently known as persons of short stature, and had various disabilities. The production focuses on inclusion through songwriting, contemporary dance, and storytelling. It was wonderful to hear Diana describe her remarkable family, and talk about how much effort went into telling their story without exploiting their obvious physical differences. I haven't yet had the opportunity to see her show, but I am really looking forward to it! To close the show, Brandon performed a set with Diana and in true Newfoundland style, they traded songs and tunes in what felt like a makeshift jam session that you just didn't want to end. What talent we have right here in our community, and such diversity among our performers! Great art depends on great diversity, and thankfully, our ideas about what diversity means have expanded to include artists across the spectrum of class, sexuality, disability, gender and race backgrounds. 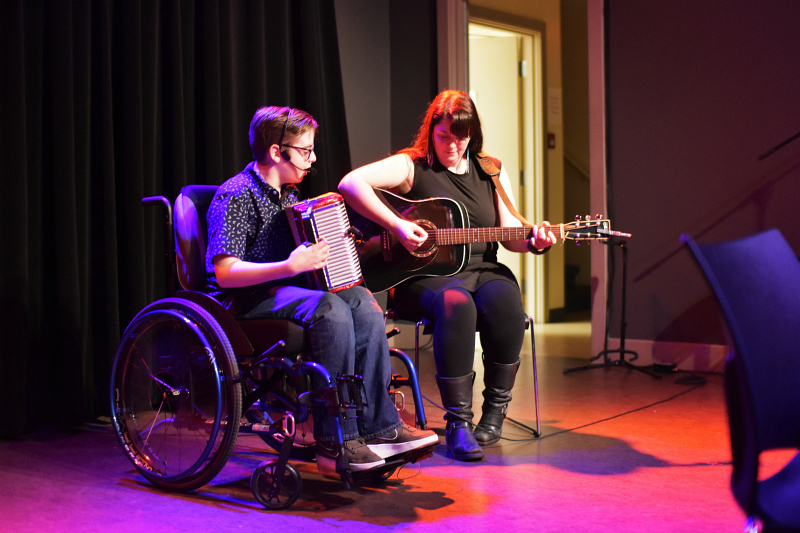 Power Productions has been working to make theatre arts in Newfoundland and Labrador more inclusive and accessible, and is committed to removing barriers that prevent participation in the audience, backstage, and on the stage itself. This issue of Live Magazine! was the perfect showcase of diversity in the arts community, and a wonderful way to integrate the mainstream community into the world that we live in, which is made up of individuals with all sorts of unique abilities. Great post! It was a lovely evening.